We had another snow a few weeks ago in our little corner of the world. Winter is still with us, for now. 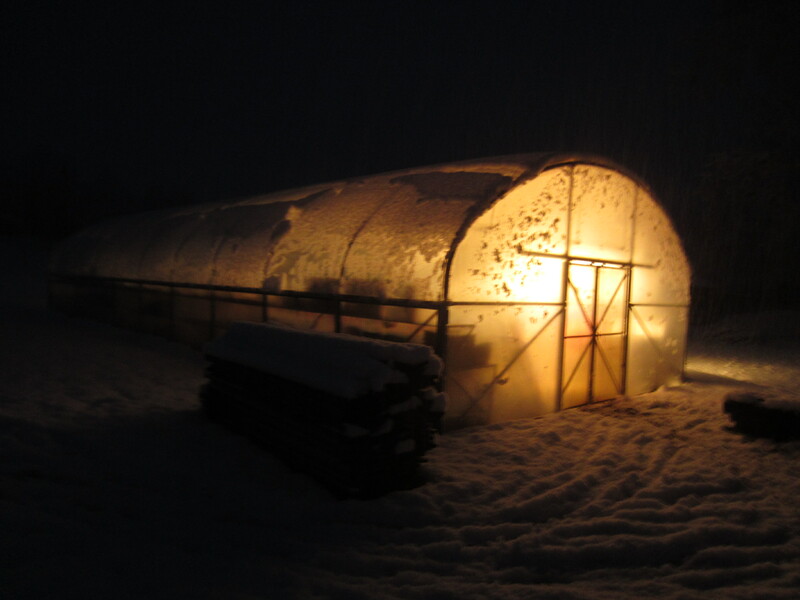 The night-time picture above was after a long day putting the ground posts in concrete, snow falling all around and the temperature hovering around freezing. Next the bows went up, all in a morning, with my Dad’s help. 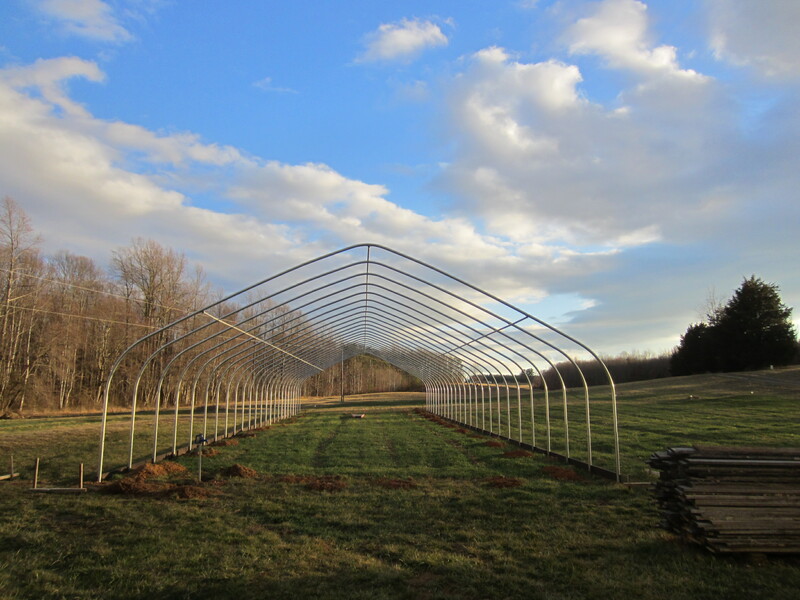 Gavin spent a few days stabilizing the structure with baseboards and a few rows of purlins. 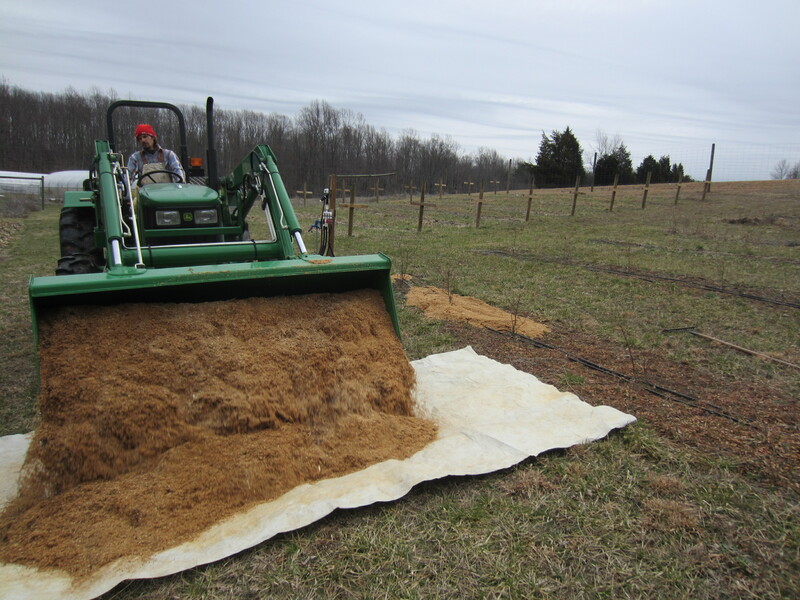 Another project underway is moving this huge pile of sawdust onto our blueberry rows. We planted the blueberries last spring and they have been mostly neglected since then, so it was time to show them some TLC. I have found it hard to allocate time to a crop that won’t produce for many years yet. 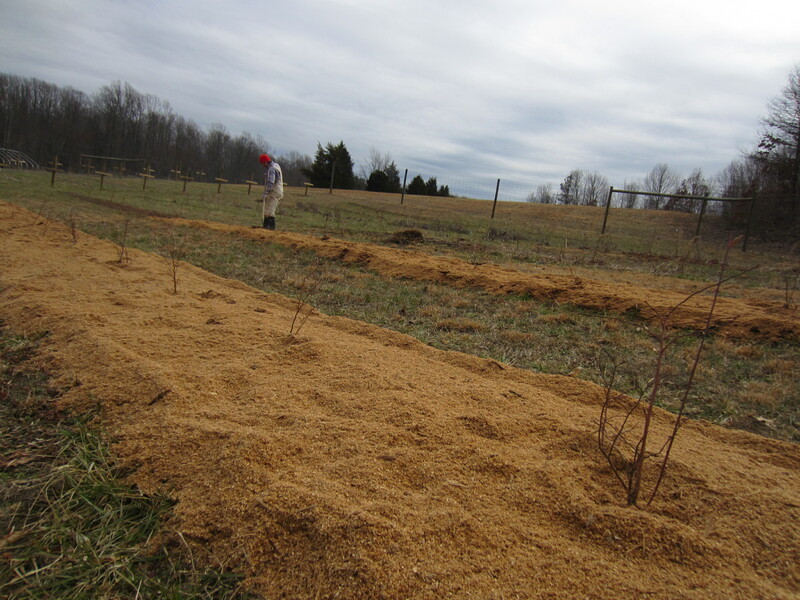 We spread about a 4″ deep layer of sawdust on the bushes. Dumped it onto a tarp with the front end loader, dragged the tarp over to the row, and dumped the contents around the bushes. This system worked well enough, but I would be curious to know if anyone has any ideas for easier ways to spread lots of bulky material like this. I hope I will never have to weed these beds again. We’ll see. We were able to cover several of the beds in an afternoon, but there is still another full day of work there. 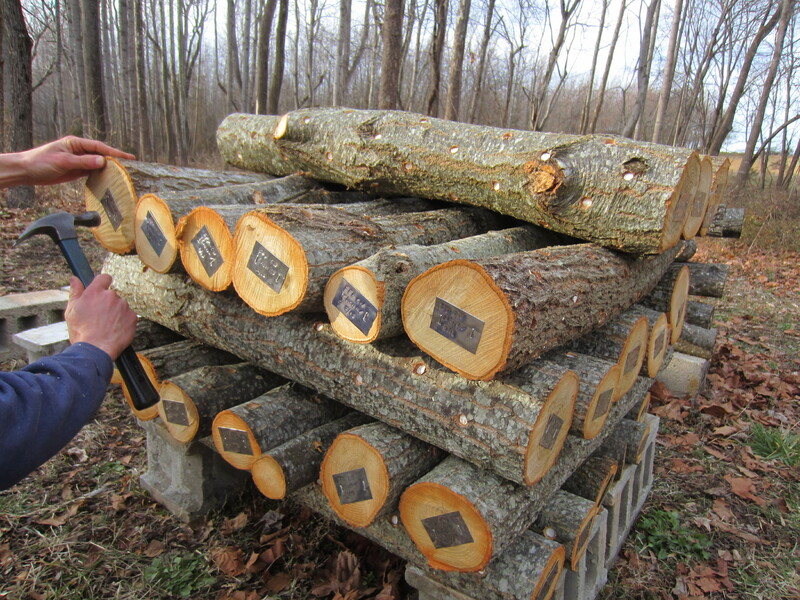 So far we have inoculated over 100 logs with shiitake spawn. This year we are using an angle grinder with a special attachment to drill the holes, which makes the drilling much more speedy. However, filling all the holes with spawn is still tedious work. We did not cut enough logs for all the spawn we ordered, so we were up in the woods again this evening cutting a few more stump-sprouted trees. I have been cleaning up the remains of the fall crops in the garden. These are freeze-dried celery leaves. And a ladybug. 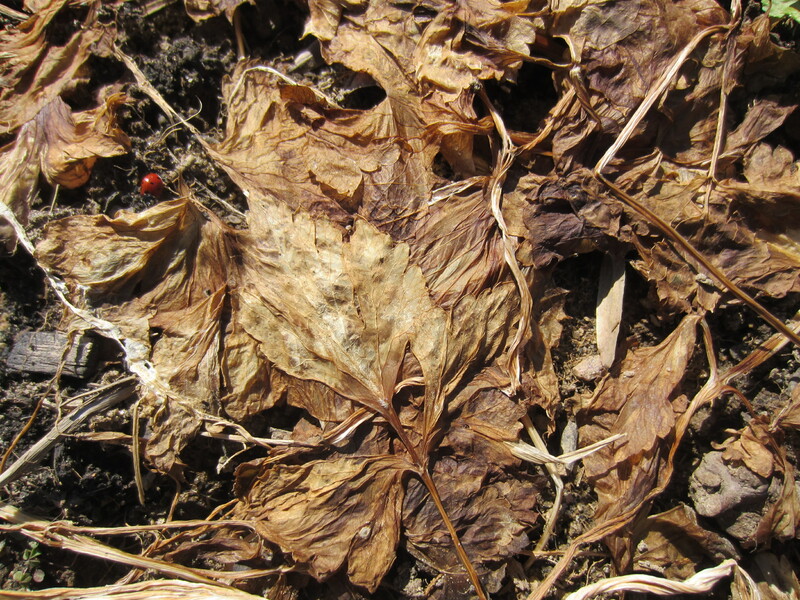 Very little remains alive from the fall crops. 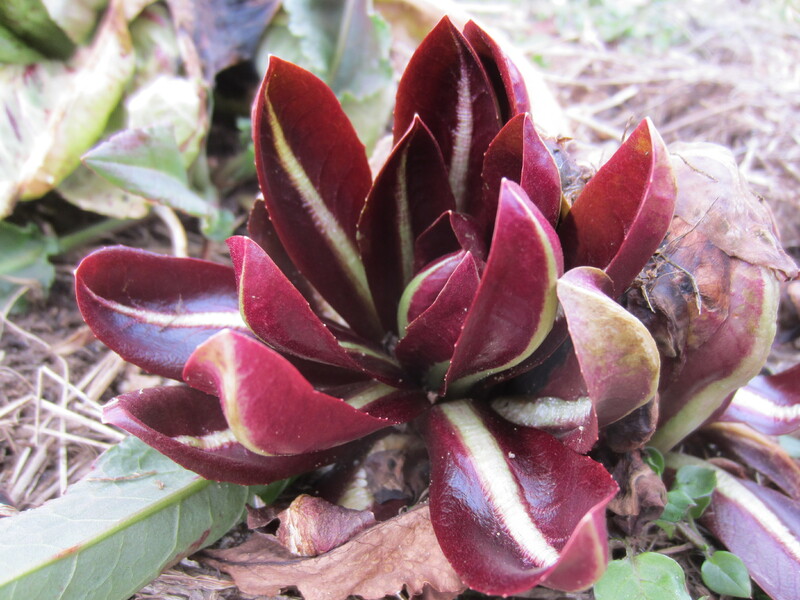 This little radicchio rosette has held on throughout the winter, and I am tempted to grow it out for seed because it is so beautiful (and cold hardy!). 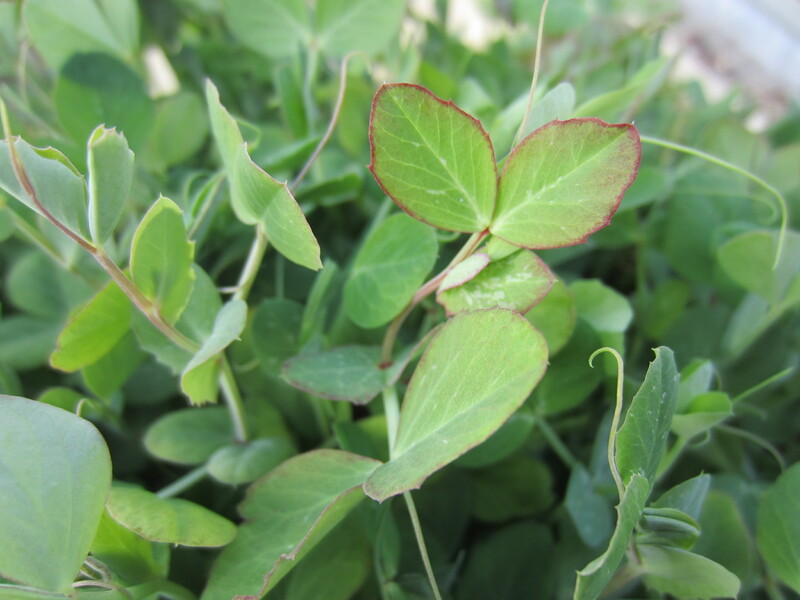 The tiny leaves would be perfect for salad mix. They are about 2-3″ long. 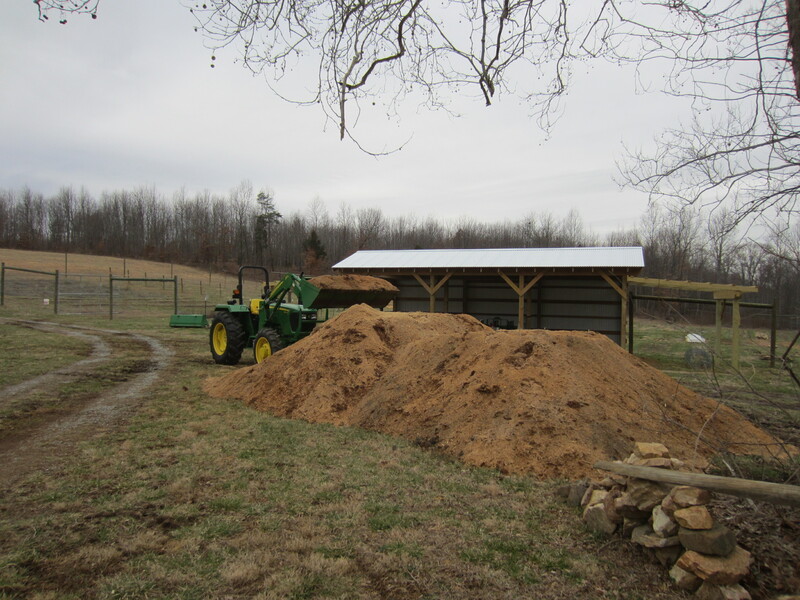 Our compost pile has doubled in size over the past week from all the weeding and bed clean-out. Here are the stalks of okra plants. They are like trees, about 8′ tall with 1-2″ thick trunks and deep roots. One of the last reminders of how vertical the garden becomes in summer! We were able to till a few of the beds in the upper garden during a very brief window of dryness last week. The lower garden will take much longer to dry out, but I am glad to have a few beds available to start seeding early crops. 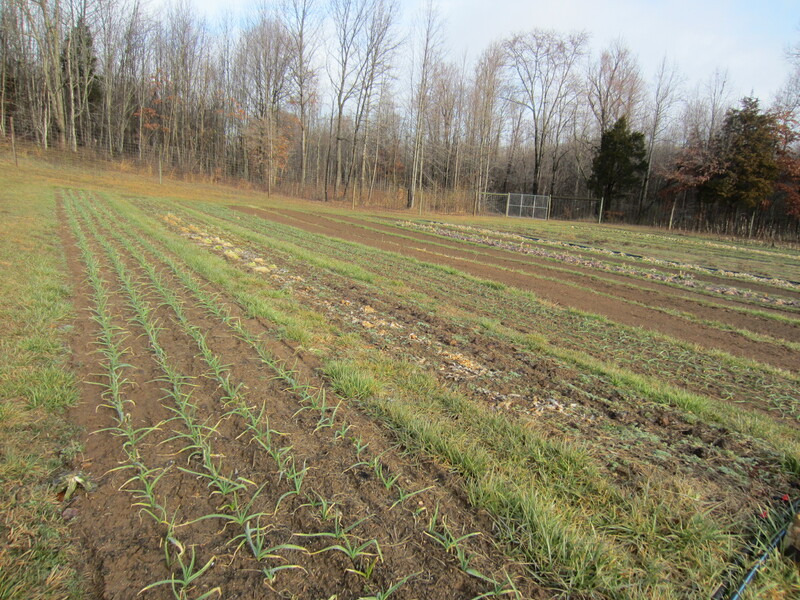 The green in the first and third rows is our garlic crop. The greenhouse is full of flat after flat of wee seedlings. Gavin has made it a priority to install the wood stove so that we will someday soon have a HEATED greenhouse. I’m sure the seedlings will approve. 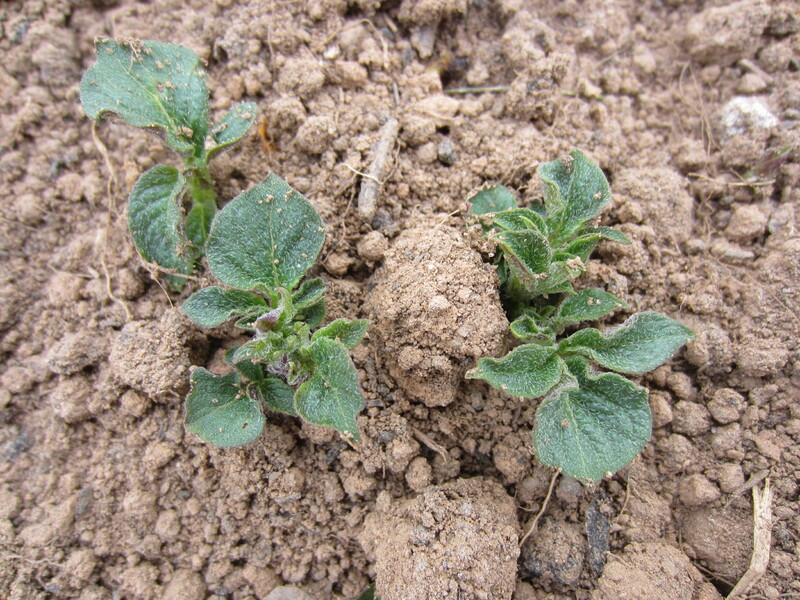 These are leaves from potatoes peeking out of the soil in the high tunnel. Growing is magic, I tell you. These little happenings fill me with joy (especially since there are always failures to go along with the successes). On these overcast chilly days it is sometimes hard to believe spring will be here in just a few short weeks. We’re ready for some warmth and light! You all are so busy in the middle of a “dormant” season! Wow. Shows how much work goes on to produce our yummy food products. Thanks. Everytime I look at your latest entry, I wonder how we can replicate you and Gavin – a million times. It would be nice to have some clones around so we could get more work done! I Love New Mexico too; haven’t been in ten years but always remember the feeling of being there, hope to get back there before too long. There is a “feeling” that has caused me to go out there so many times – I can hardly remember each trip. Heading out there again – soon. Truly, you and Gavin give me hope for not only our present, but our future. I really appreciate your kind words, Teresa! We grew some last year, which was our first time. Check back in the March 2012 posts for pictures from last year. 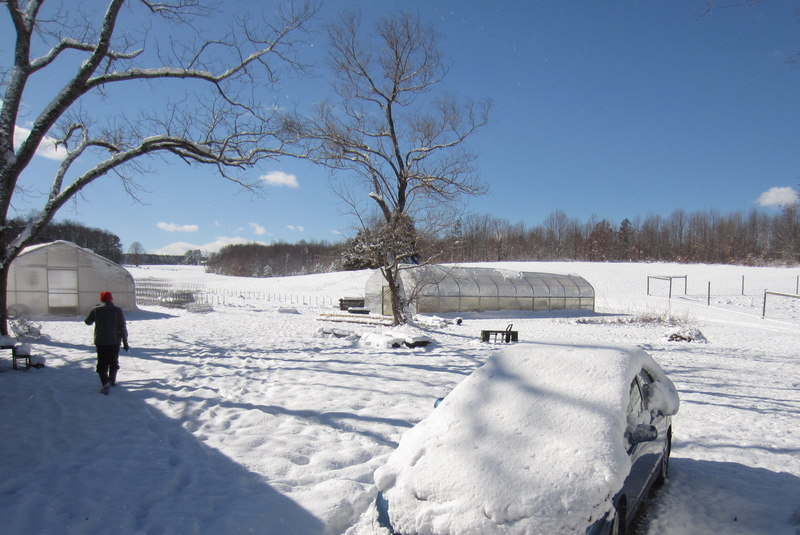 We inoculated in the spring and had some to harvest in the fall. 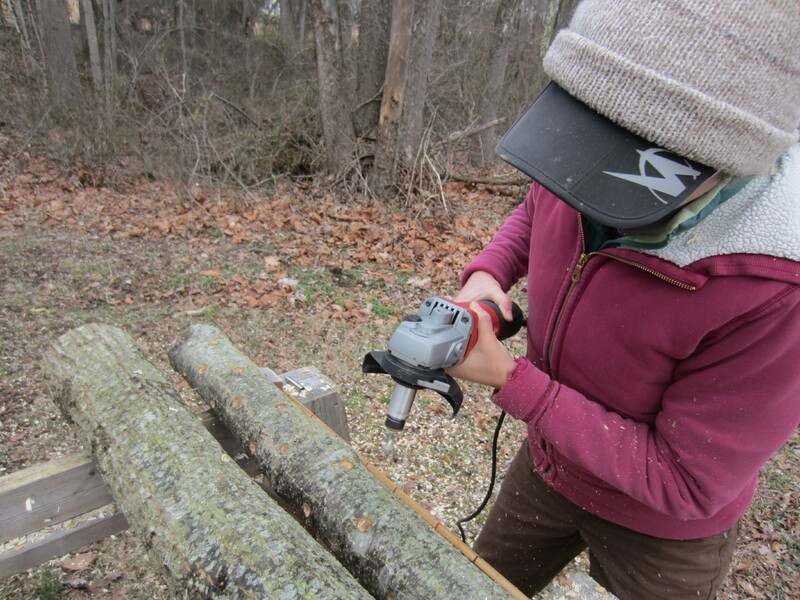 It is easy enough to do, if you already have an angle grinder or drill and chainsaw or source of freshly-cut logs. There are a lot of online resources from different universities on shiitake production; that is how we figured out what to do. Also some of the suppliers have good resources on their websites, I especially like Field and Forest Products and Mushroom People. And check out Cherry Tree House Mushrooms, a great informative wordpress website all about mushroom production in Minnesota. If you love mushrooms, they are certainly fun to have growing in your own backyard! Your place is so lovely. I hope we can get our farm in as good of shape as yours? Do you have any farm tours planned this season? We could learn so much from y’all! We’d love to visit. Thanks. I’m sure your farm will succeed, it just takes passion and lots of hard work, as I’m sure you know! Your growing area looks great! I’ll let you know if we have some farm tours this year, we hope to but sometimes it is all we can do to just grow crops and get them to market. Or if you are going to be in the area let me know. Not sure how much we could teach you, most of it is just trying things out and learning from our mistakes! Hi Arnie! You are right, the sawdust is supposed to be aged so that it doesn’t rob the plants of nitrogen. We did not have aged sawdust because we didn’t plan ahead enough! We did fertilize around the plants before we put the mulch on, but it will definitely be an experiment to see what happens. 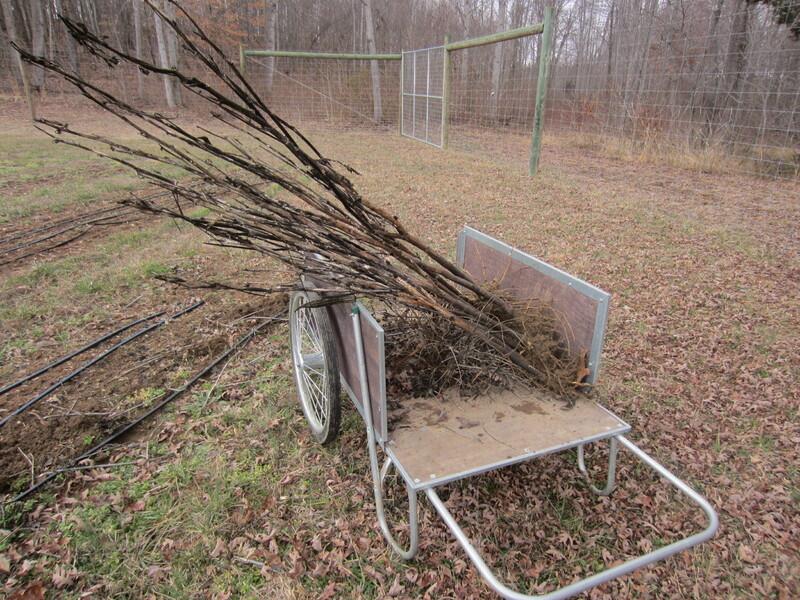 Some of the bushes didn’t survive the year, so we will have to replant at some point; maybe the whole planting if the sawdust adversely affects them. This is how it goes when we do not properly prepare for a planting, a lot of risk! We are still on the fence about growing berries at all because we had a problem with spotted wing drosophila last year. A great update with awesome photos as usual. 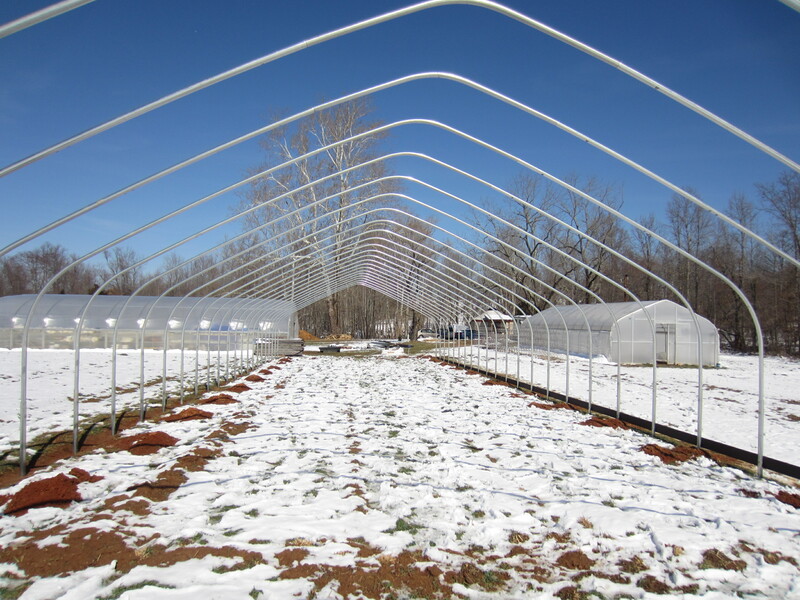 That’s a really big high tunnel, I have one but it’s not nearly as large. I can’t wait to see progress updates on the mushrooms as I’m considering growing some myself and have absolutely no experience with them. I’ve tried various time/labor savimg methods for applying large quantities of mulch/compost and I haven’t found anything much more efficient than your method. Keep up the great work, the spring warm up is near. Kevin, we are definitely hoping for bountiful harvests of mushrooms in the fall, so we’ll see how that goes. If you have a shaded area and a means for watering them nearby I say go for it, mushroom growing is fun. Not sure how they will turn out in terms of profitability, but they are so delicious. The inoculation is really not that bad, just tedious, but if you have several people helping out it would probably be fun. 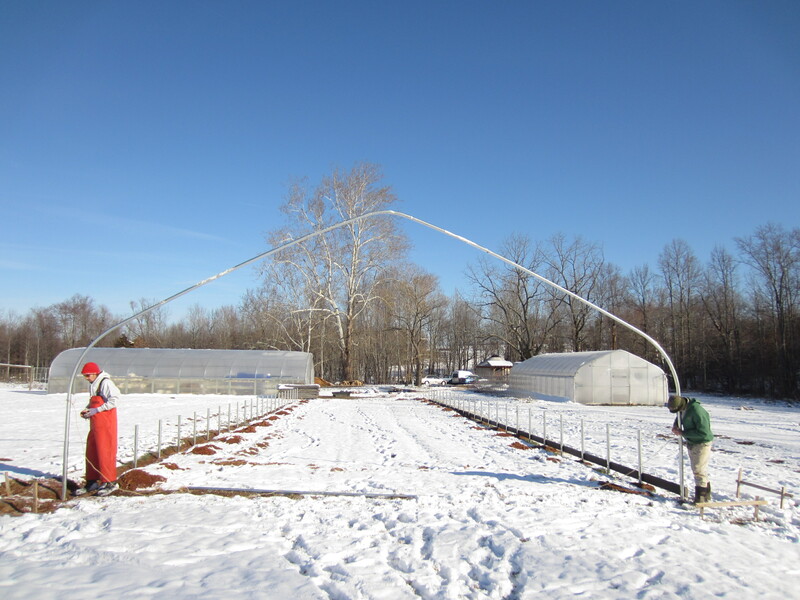 Hope you are enjoying a jump on spring in your high tunnel!